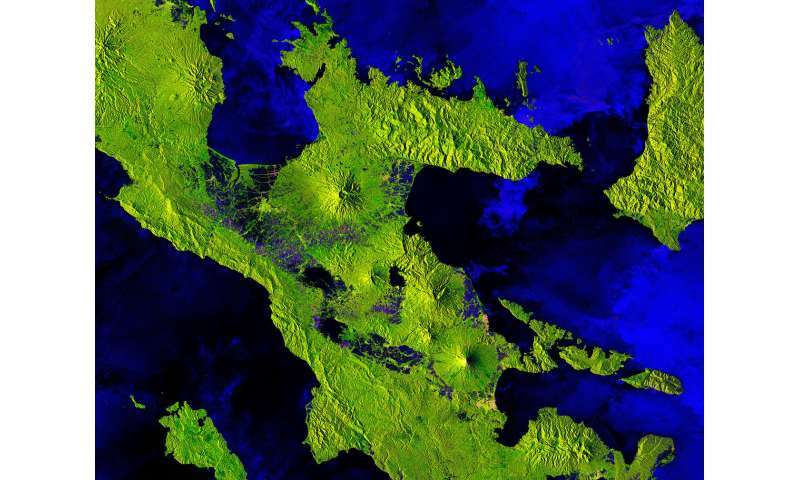 The Copernicus Sentinel-1B satellite takes us over one of the most active volcanos in the world: Mount Mayon on the island of Luzon in the Philippines. Luzon is the biggest island in the Philippines and home to most of the country's active volcanoes. This volcanism is associated with plate tectonic processes where the floor of the South China Sea is being drawn down into the mantle along the Manila Trench, which is to the west of the island. The image just shows part of the southern end of this large island, but features no less than five volcanoes. While Mount Mayon – the most southerly volcano in the image – is famous not only for being perfectly formed, but also for being one of the most active in the world, the other four volcanoes in the image are actually either dormant or extinct. Dubbed a perfect volcano because of its symmetry, Mount Mayon has a classical conical shape, built up by many layers of hardened lava. It erupts frequently with the most recent eruption occurring in January this year. This image was captured on 16 January 2018 and while satellite radar isn't typically used to detect hot lava flows, the way it has been processed reveals a pink line running down the southeast flank of the volcano that matches the flow of lava in optical images from satellites such as Sentinel-2. The predominant bright green in the image corresponds to vegetation, the lighter green and pink to towns and the blue to cultivated fields. While the Sentinel-1 radar mission is used for a myriad of everyday applications, it is also used to detect ground movement, which is essential for monitoring shifts from earthquakes and volcanic uplift.